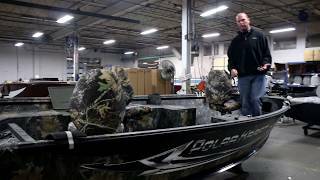 The OUTLANDER Line of Aluminum Boats from PolarKraft offers a number of versatile models - great for any interest and budget! Whether you are serious fisherman, or a dedicated duck hunter, OUTLANDER’s superior construction is your best choice! © 2017 PolarKraft Boats, 300 E. Chicago Ave., Syracuse, IN 46567.